Blue is one of those rare boats that comes up on the market every so often. 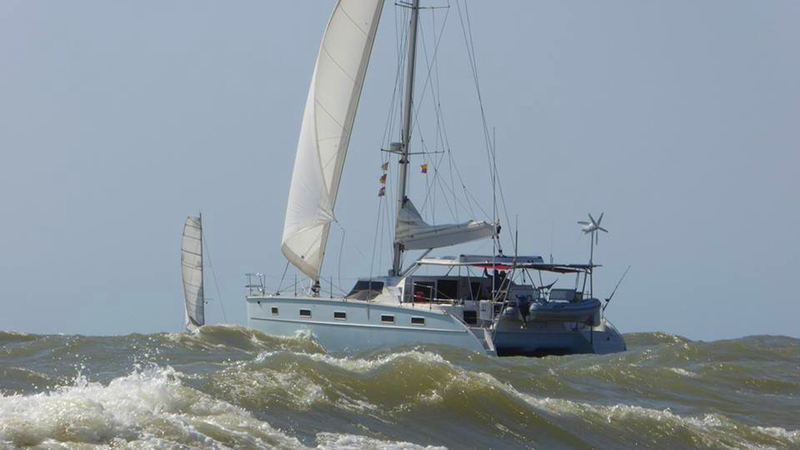 From the exceptionally well-maintained systems that includes an overhaul of the mechanical system, to new electronics installation and a pristine set of sails (to name a just a few), this 2006 Antares 44 has had significant improvements and is equipped for ocean passages both near and offshore. Here is what the current owners have to say about their time aboard Blue. "We are a family of three who have loved and sailed Blue along the US East Coast and the Caribbean. Blue has been our floating home for the past five and a half years where we have lived on and off her while our careers flourished in the US and overseas. We would vacation on Blue while she was in the Bahamas, North Carolina or Florida. 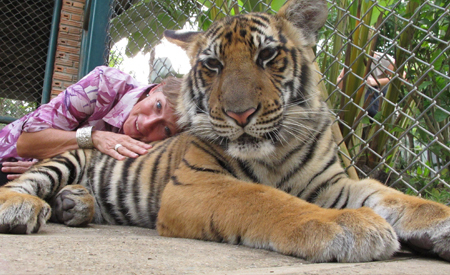 We also took two separate year-long sabbaticals, living on her full time while cruising to various Caribbean islands, including joining rallies (Salty Dawg and Suzie Too Western Caribbean rally). All the while, Blue was our sanctuary taking us safely and swiftly to new destinations near and far. We have had her as far north as Annapolis, MD and as far South as Shelter Bay, Panama". "We have learned to sail on her from the very beginning, living in comfort, making new friends, visiting new destinations and spending quality family time together. We consider Blue as part of our family and our latest plan was to cross the Pacific in 2019. Consequently we made significant improvements in preparation for the Pacific crossing such as new sails, electronics, rigging among others." "Due to fortunate circumstances, however, we are taking our adventuring to the West Coast, putting our Pacific crossing on hold. Accepting instead a unique job offer in San Francisco, the crew on Blue would like to pass her on to a new owner who will give her the attention she deserves in the coming years. 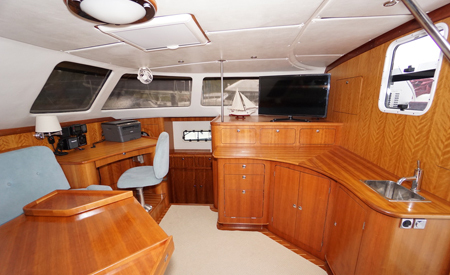 Blue is a wonderful sailing vessel and she is ready to go where ever the wind may take her." And if you're short on time the owner will deliver anywhere on the US east coast, the Bahamas, BVI, or Eastern Caribbean! For the complete specifications on Blue, link to the Yacht World listing or give us a call at (978) 549-7912 more information. Are you the next accidental circumnavigator? "I would have never stepped aboard Miss Jody had I known we would end up sailing around the world. My husband Ron, a life-long sailor and racer convinced me to go cruising. Our plan was to sail as far as the San Blas Islands in Panama, with the caveat that I could always go home if I didn’t like it. I could jump ship and buy a bus ticket from the Florida Keys back to Pensacola, Fla., and it was relatively easy to return home from the Caribbean." "Don't get me wrong, I love traveling, and the opportunity to discover new places and meet new people has always been a big draw for me, but I never imagined the 'getting there' part would be by sea, and certainly not in a 42-foot catamaran. 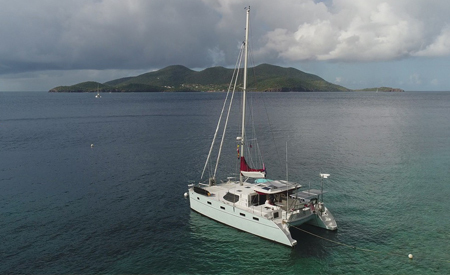 Miss Jody is an Antares 42, a predecessor to the Antares 44, and for a reluctant sailor, a catamaran would be an excellent vessel for us to explore the Caribbean." Link here to read part 1 of Joanne's full story in Blue Water Sailing magazine. Link here to read part 2 of Joanne's full story in Blue Water Sailing magazine.